In graduate school I was fortunate to study under the late Phil Frickey, Professor of Public Law at Bolt School of Law at the University of California Berkeley. My interests in Indian law drew from a research agenda involving the Alaska Native Claims Settlement Act of 1971 and its affects on indigenous relationships to land and water in Alaska. I took both Federal Indian Law I and II, as well as a semester of independent study, from him as he wrote the seminal work American Indian Law, Cases, and Commentary with his colleagues, legal scholars Anderson, Berger, and Krakoff. I found him generously patient with my general fumbling and innocent gaffs, letting me find my way through the nonlinear world of Native American law. Aside from legal study, one of the lessons he taught me was to try steering away from normative statements in my work. One day after class he invited me up to his office to talk about a term paper. His office was a few floors up, in a converted dorm room, with a fantastic view of San Francisco bay. I sat down and he handed me the giant book Alaska Natives and the Land. I believe another student, a child of an Alaska state politician, gave the volume to Frickey and he in turn loaned it to me, indefinitely so it seems. 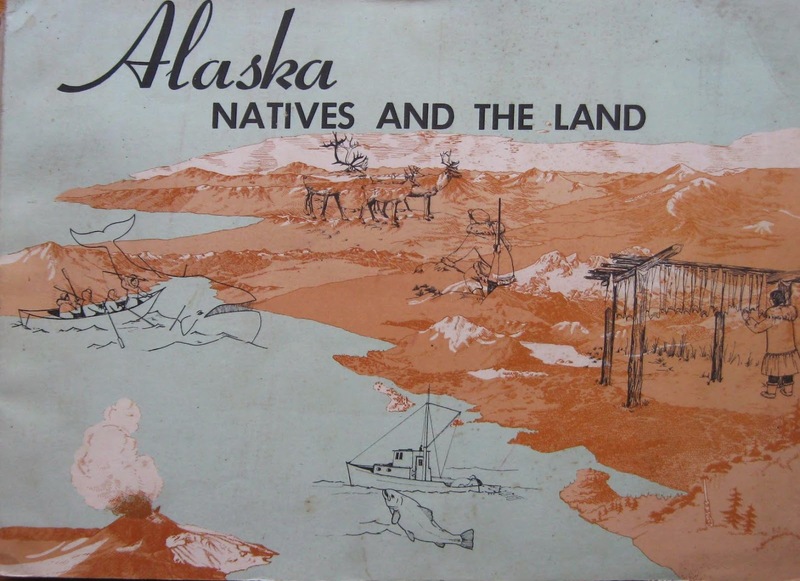 The humongous volume Alaska Natives and the Land composes a 565 page study of Alaska, its people, and natural resources by the Federal Field Committee on Development and Planning published 10 years after Alaska statehood in October 1968. When open on my desk the work spreads out well over two and a half feet. After the discovery of oil deposits in Prudoe Bay March 1968, the book served to educate congressional lawmakers about the region's indigenous people as Native leaders and activists labored with state and federal officials to come to terms with settling the issue of Native title. The book includes a marvelous 3 foot by 2 and a half foot foldable map detailing the Native communities within the state. The chart breaks down the regional areas with Native populations by size and by specifying whether the sites are predominately Native in nature (colored blue) or if they are non-indigenous sites with Native populations (red on the map). The book begins with an overview of Alaska Natives, moves to aspects of village life, to a chapter called Land and Ethnic Relations. "In their use of biological community for livelihood the Native people "occupied" the land in the sense of being on and over virtually all of it in the pursuit of their subsistence, but they did not "occupy" the land in any agrarian or legal sense as understood by Anglo-American Jurisprudence." Thus four years previous to the passage of the settlement there was an ideological argument against "Native title" even though indigenous actors themselves had been taking to the courts in regard to this matter for decades. In the exploration of the Kodiak region, the book extrapolates on the ways of Alutiiq people based on the Hubert Bancroft's History of Alaska(1886) and Ales Hrdlicka's Anthropology of Kodiak Island (1944), in the thesis that Kodiak Islanders, before the arrival of the Russians, held no reasonable form of government and simply foraged off the land and sea, "consuming anything that can be digested." These two misleading observations perhaps helped lawmakers conclude in the non-recognition of Native title during the time of settlement. This small read of the 565 page work lends little justice to the scope and importance Alaska Natives and the Land played in the passage of the land claims settlement and I would encourage anyone pursuing a course of research in Alaska Native geography, law, history, and culture to track down a copy. Also, Alaska Natives and the Land proves a great example of the many books written about areas of the world the US acquired through its various means. I have seen such volumes written on other national colonies such Hawaii, Puerto Rico, and the Philippines. There are a few copies of Alaska Natives and the Land available on Amazon.